I love the idea of a vardo-type conveyance, but so many events relegate them to an area away from the tents, which puts me off a bit as I am incredibly introverted and prefer to attend events with my local group. So, I reverted to looking at tents. There is clear evidence that the Romans used large round tents with a center pole, and, some say spokes radiating out from the center pole. This is speculation because while the scholars say round yes, they note a lack in the written or pictorial record for the inside of the tent roofs. That said, there is abundant pictorial evidence of the round tent from exterior views and many internet friendly places to explore them. For example, Levantia, the blog of Dr. Timothy Dawson re-creator of history and academic, has a wonderful page on tents. On Facebook I frequent several Byzantine oriented pages: SCA Byzanteam where we had a long discussion of tent styles suitable for an SCA persona who is 10th Century and Byzantine and Byzantine Army where the scholarship is delightfully good, and participants give evidence (and sharing images) to support their positions. The favored images from the historical record brought up in each discussion and on Dr. Dawson’s web page, are similar if not the same. Looking on my own via “googling” turned up pretty much the same images. 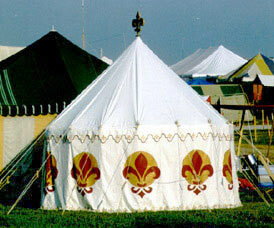 Being that I am not planning on becoming a scholar specializing in research on tent usages in the 10th century, I decided to count the fact that I am interacting with persons far better educated in the field than myself, that it is safe to say the round pavilion with a center pole is an excellent choice. White is the basic color of the canvas, and some persons use paint to decorate the walls–like the image from Panther Primitives. This has lots of FUN ideas bouncing around my head. The next nagging question is: Which dagging option for around the top of the tent walls do I want? Which is more likely to have happened in period?